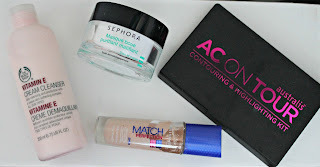 In July I went to Sephora in Sydney (it had just opened up and I had never been to a Sephora before) and bought a few items. I decided to by only Sephora branded makeup because we don't have the Sephora brand in New Zealand, and all the other brands (Urban Decay, Kat Von D etc) we have already so I thought I would buy the brand we don't have.. I set out wanting a Mud Mask, and some body wash - the rest I just picked up along the way. Leaves the skin toned, invigorated and helps to protect the skin against free radicals. Lightens skin to improve skin tone and provides day-long moisture. These smell AMAZING. They make the bath smell so good! Definetly picking up a few more of these in other flavours next time! I love this body wash, I have the strawberry and so got the tester for the blueberry but I'm going to be buying the full sized blueberry next! Paraben free, enriched with strawberry pulp extract, produces a creamy foam. Adds volume, lengthens, separates, curves, nourishes, strengthens and protects. This is such a pretty colour, and the formula is creamy, but matte. It's such a wearable colour and I love it!